PIC List Testing Made Easier - Perelandra Ltd.
For the best results and easy scheduling of Perelandra Solutions and Essences. PIC = Perelandra Information Center. Think of PIC as a specialized "library and classroom in the sky" that holds the complete body of information and understanding connected with all of the Perelandra Essences and Solutions. PIC allows you to combine the Perelandra bottles in a way that will give you broad, effective results when addressing an issue or for your general daily health. PIC can be used for your health, for any mental or emotional challenges, for supporting changes, for your environment, plants, animals, gardens and soil-less gardens. PIC will give you direct insights and understanding about how the Perelandra Essences and Solutions can help you personally. 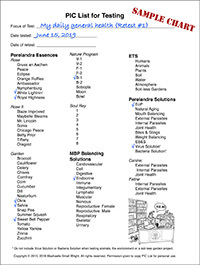 You do not have to buy all of the Perelandra Solutions and Essences in order to use PIC. You just buy the bottles you need, as you need them. PIC simplifies your use of the bottles by zeroing in on just what you need for daily health or specific issues. The dosages are simple. You take your drops twice daily and can easily work it into your schedule. Also, there is only a 10 second wait time when it comes to eating, drinking, etc. All those questions about choosing and taking different types of Perelandra Solutions and Essences that created a scheduling nightmare for you are eliminated by PIC. With PIC, you also do not have to use PKTT (kinesiology). So if that was holding you back, you now have a simple alternative. Anyone can do this with ease and confidence. What's keeping you from trying it? Reading the free brochure? We're not going to let that be your excuse any longer. We're going to do a PIC List test with you now. In less than 15 minutes, you will have completed your first PIC List test. Let's get started! First, download the PIC List for Testing chart. You can print it or fill it in on your computer if you like. Your preference. Next, BREATHE. Yes, all eighty-nine Perelandra bottled products are listed on this chart. You DO NOT have to buy them all. Sit down at a table or your desk in a quiet room, with no distractions, with your pen/pencil/computer and a PIC List for Testing chart. 1. All you need to do is state: "I'd like to activate PIC." The connection will occur instantly. No waiting, no testing and no drops are needed. 2. We're all going to start with the same focus today. This will change when you're ready to test specific issues. 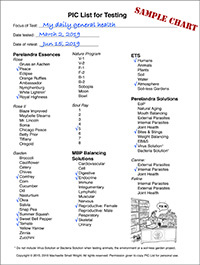 On the first line of the PIC List chart (Focus of Test) write: "My daily general health." Then write the date on the second line of the chart. Test the list. You must test every bottle on the list, including the MBP Reproductive Male Solution even if you are female (or vice-versa), the cats and dogs Solutions and ALL of the ETS options. There are two ways to do this. 3A. Use PKTT (the Perelandra muscle testing technique) to test the PIC List and identify which bottles are needed for the focus. Be sure you test every line on the List, one name at a time. 3B. If you are new to Perelandra or don't know how to work with PKTT yet, PIC will work with your unique package of tools that naturally kick in when you seek information and understanding, especially your intuition. The key here is clarity in focus. You can't let your mind wander and you can't think about dinner. And it definitely doesn't help if you can hear a bunch of noise in the background. First relax and quiet your mind. When you're ready, read each name on the PIC Testing List slowly, one name at a time. Allow yourself the calm and space to feel your intuition working as it indicates the "yes" for the bottles that are needed and "no" for the bottles you won't need. Don't second guess yourself. Trust your PIC-assisted intuition. Place a check mark next to the name of each bottle that jumps out and feels like a "yes." After reading through the entire List, you'll have a check next to the names of the bottles you need for this focus. Your biggest challenge is to stay out of your own way and let your PIC-assisted intuition do its job. For each product name on the list, ask: "Do I need ________ for this issue?" Then feel, sense or hear the yes or no (or kinesiology test). Trust the first hit you get after asking. Don't waste time and energy second-guessing yourself. If it's yes, put a check mark next to the name on the List. Move to the next name on the List and repeat the question. 4. Congratulations! You have now completed your PIC test and you know exactly which group of Perelandra Solutions and Essences will support your daily general health. This group is what we call a "PIC Unit." The number of bottles needed will vary from person to person, depending on your current health condition and the factors in your life impacting your daily health. Here's what our sample chart looks like (at right). This is a sample. You will have different bottles checked. Click on the image to view a full-size version. 5. If you happen to already have every single bottle that you checked on the chart, get those bottles out now. If you are missing just one or two, don't have any of the bottles you need or if you have some, but not all, skip to step #9. 6. When you have all of the bottles needed for your PIC Unit in front of you, take the usual recommended dosage from each bottle. Take the drops orally. You don't have to wait any amount of time between taking each bottle, but don't mix them together in one cocktail. Perelandra Essences (Rose, Garden, Rose II, Nature Program and Soul Ray): Take 1 drop from each bottle needed. ETS: Take one dropperful (10-12 drops). This applies to all types of ETS. MBP Balancing Solutions and Perelandra Solutions: Take the number of drops listed on each label. 7. After taking your first dose of each bottle needed, ask, "Will a retest be needed?" If the answer you feel or test is yes, there are two ways to get the retest date. Using PKTT: Test a calendar week by week, asking the question, "Is this the week for the retest?" The positive response indicates the correct week. Then test each day of that week to determine the date for your retest. Using intuition: Move through a calendar focusing on each week, one week at a time, and ask, "Is this the week for the retest?" Once you determine the week, then focus on each day of that week one day at a time to get the retest date. 8. Write the retest date in the space at the top of the PIC List. 9. State (aloud or to yourself): "I'd like to close PIC now." The PIC session closes immediately. If you did not have all of the bottles you needed after testing the list, order the bottles you need to complete the unit. When your bottles arrive, get out your PIC chart and say "I'd like to activate PIC." Next, read your focus, "This is for my daily general health." Then do Step 6 through 9 above. You must have ALL of the bottles tested before taking them as a PIC Unit. You can't take what you have, then take the rest when they arrive. Always take them as a unit. 10. The bottles that tested positive on your List contain the electric patterns that you need for your daily general health. They are your "PIC Unit" for this issue/focus. Take the drops needed for this unit twice daily; once in the morning and once in the evening. You are taking these drops orally, one bottle after the next, until you've taken the drops needed from each bottle. You only have to wait 10 seconds before and after taking the unit of drops for eating and drinking. There! You're off to a great start supporting your health using the Perelandra Solutions and Essences. And now that you see how NOT scary it is, read the PIC Brochure. It will fill in the gaps and improve your understanding and use of PIC. One night this week, take a break from Facebook, texting, web-surfing or staring at the TV and read PIC instead. You'll read the whole brochure in no time and be ready to take on whatever health challenge may come your way. The time frame between retests can be short (days) or long (weeks and months), depending on the situation you are addressing and your rhythm for moving through it. It is important when working with PIC units to take the drops daily until the day before the next retest. Do not cut the retest periods short, no matter what. The unit is still doing its job and the depth of resolution that you seek depends on this timing. For any PIC List test, you take your PIC unit of Solutions and Essences twice daily beginning the day after your test (or, if you had to order some bottles, beginning the day you have all of your bottles in that unit together). Stop taking that PIC unit the day before your retest date. With PIC, that day that you're not taking the unit is clearing out the body in order to get an accurate testing for the retest. In our example charts, the twice daily PIC unit drops start on Saturday, March 2. The retest is Saturday, June 15, so the last day to take the PIC unit drops is Thursday, June 13. No drops would be taken on Friday, June 14 (the day before the retest). On the retest day, download another PIC List for Testing chart. (You can print it or fill it in on your computer.) Then, sit down at a table or your desk in a quiet room, with your chart, a pen/pencil/computer and no distractions. 1. State: "I'd like to activate PIC." The connection will occur instantly. No waiting, no testing and no drops are needed. 2. On the first line of the PIC List chart (Focus of Test) copy your focus from your first chart. In this case: "My daily general health." If you'd like to keep track, you might add "Retest #1." Write the date on the second line of the chart. 3. Test the List. Remember, you must test every bottle on the list. You are doing a completely new test so forget about what tested positive the first time around. Again, you have two ways to test: The easy way using PKTT (the Perelandra muscle testing technique) or using your PIC-assisted intuition. Then muscle test or feel/sense/hear the yes or no. 4. Congratulations again! You have now completed your first PIC List retest. The number of bottles in this new unit might be more or less than your previous test, and it may include some of the same bottles that were in your first unit. Here's what our sample chart looks like (at right). Of course, you'll have different bottles checked. Click on the image to view a full-size version. 5. Continue with Step 5 above. You will repeat the retesting cycle until you no longer need any bottles when you test the PIC List. That's how easy PIC is! Now you're ready to do a PIC List test for any issue that pops up. If you are in good health, we encourage you to do this PIC testing for daily health now. That way, if you get sick, you won't have to go through a learning curve. You will already know exactly what to do, and you can PIC List test in 5 to 10 minutes. The support you'll get from your PIC unit will help you move in the right direction quickly. If you still haven't read that PIC Brochure, now is a good time to curl up with Machaelle's helpful, very short booklet and get up to speed. Reading it will fill in the gaps, answer your questions and improve your overall understanding and use of PIC. Enjoy your stronger health and balance. And if you get confused or have a question, give us a call!